People are no longer rushing to buy a product, they are instead beginning to pause and weigh the pros and cons of their decisions before parting with their money. You could do some smart shopping when it comes to choosing your lawn mower. Because of the huge range of lawn mowers available on the market from hand pushed, to gasoline powered and electrical we need to be able to make an informed decision when choosing a machine. The best way to do so is to first identify your personal needs in terms of lawn care. - The first factor to be considered is the size of your yard. For small yards push machines are good; for medium to big yards you need a riding lawn mower and for the really huge yard a lawn tractor. 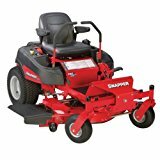 - If time is a problem for you and you cannot afford to spend lots of it on mowing the lawn then get a riding mower. - If you are not a hundred percent physically fit it is best to get the riding mower; you will not need to exert any energy pushing the mower around and you also need not spend too much time in the sun. - Consider the environment. If you live in California there are very strict rules in place so make sure you get a CARB compliant or certified machine. In actual fact irrespective of where you live, protecting the environment is everyone’s responsibility. - One major factor for consideration when buying your riding mower is your budget. These machines do not come cheap so be prepared to spend some serious money. - There are also a host of accessories that can be purchased to compliment your mower – rule of thumb, do not buy what you don’t need. - If you lawn has obstacles in the form of trees or flowerbeds you will need a machine that has great maneuverability; get the rear wheel driven machine where the rear wheel turn independently. - Consider factors like weight, power, safety features, how easily you can start the machine, easy handling, clippings disposal including easy bag handling and maintenance requirements before you buy. - Mower size is measured in terms of deck size; riding mowers start at 30 inch decks. In order to figure out the right sized riding mower for your yard, measure the width of the yard – this will tell you how many passes you will have to make with a 30” deck to get the whole thing done. If you have space to maneuver you can go for a bigger machine. - Lawns that are mostly level do not require a very high horsepower engines; however, if you have inclines and thick grass you will need higher horsepower to give you extra punch to get the job done efficiently. - Turning radius of your riding mower is very important; if you cannot make tight turns you will end up have very messy corners around trees and flowerbeds. Don’t base turning radii on the size of the machine – check the specification. - The brand you choose should be able to provide you with spare parts and efficient service so don’t forget to keep this in mind.